Narratium is a modern responsive WordPress theme designed and built for writers and bloggers. Created with simplicity in mind. All Narratium configuration options are integrated and use native WordPress functions for ease the managing, avoiding struggle in dealing with third complex configuration panels that become obsolete over time. This makes it a perfect theme for both advanced and beginners WordPress users. Dynamic Navigation (AJAX): AJAX Navigation can be activated with just one click to accelerate and approach the navigation throughout the website. Come with various transition effects. Text Format Tags for Titles: Narratium introduces titles (and subtitles) with text format tags. This allows you to give text format tags (bold, italic, color) to your postâ€™s titles and subtitles. Extended Template System: Narratium implement a system of templates que permite que dichas templates puedan ser intercambiables. AsÃ­ por ejemplo puedes. 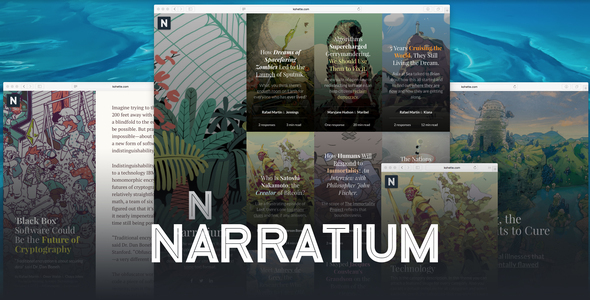 Focused in the future: Narratium is compatible with WordPress Gutenberg and follows closely its development. Color Schemes: Narratium come with a serie of predefined color schemes that can be selected for the entire theme and also individually for any post. You can set the theme with a color scheme but configure any post to display with others colors, adding a plus of customization for your posts. Post Co-authors: In some magazines you can find articles written by various authors in conjunction. In Narratium you can indicate co-authors for your posts. These co-authors appears in the theme next to the postâ€™s author. Video covers for posts: You can upload a video file to display it in the place of the featured image of the post. Category templates: You can easily set up the design you want to display the items in every different category of the site. Read time: Narratium can automatically count how many words has every article to give to the reader an idea of its length and time it will take to read it. Third party comments: You can use third-party comment systems in your articles. Narratium comes with integrated support for Disqus and Facebook Comments. Icons: Narratium imports a custom typeface that display icons anywhere on the page and let you manipulate them easily as if they were a text. You can easily accompany the site menus and content of the articles with any of these over 400 icons by adding them as it is explained in the documentation. See image. Designed for social networks: Every Narratium item contains the corresponding metadata to ease the sharing on the major social networks like Facebook or Twitter. Fully prepared for Twitter Cards. Authorâ€™s contact field included. Every author can add their Twitter and Facebook username and will appear on the profile. Besides, these contact data will be also used when any visitor shares an article on the social networks.